The Kissing Ball Mistletoe made from succulent plants. Photo courtesy of Lauren Karnitz. It seems that ‘under the mistletoe’ is the hottest place to be for the holidays, and ‘kissing balls’ of mistletoe have adorned homes at least since the days of Victorian England. The unfortunate thing about real mistletoe is that the parasitic plant is highly poisonous and doesn’t even last long in displays since it dies the moment it’s cut from the branch of its host tree. That’s where mistletoe cactus comes into its own. Plants in the Rhipsalis genus acquired their romantic common name because like the real mistletoe, it hangs from trees and bears white, round berries. But these cacti are benign plants called epiphytes that live in the treetops without harming their hosts. 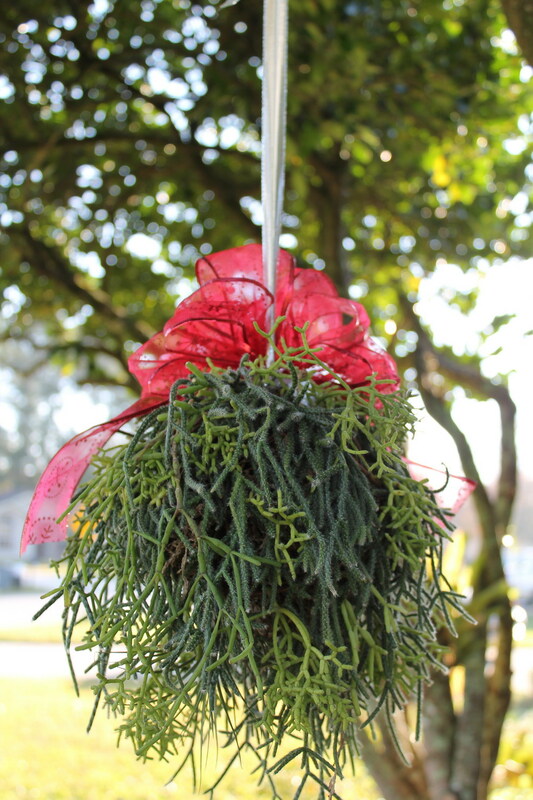 This means that unlike the real mistletoe, Rhipsalis can continue to live on their own accord. If you cut a stem and provide moisture, it will form roots of its own. I’ve made these kissing balls for years and have even included one in my book on creative houseplant projects, Plant by Numbers. Oddly enough, it took me a while to even consider giving them a holiday makeover! I got the idea when scrambling to think of a more natural looking way to grow my orchids and other epiphytic plants, and the affordable grape vine balls sold at Michaels were perfect. Photo courtesy of Lauren Karnitz. Making these living Christmas decorations is a lot easier than you would think, and the mistletoe cactus plants are easy to find with the at your local nursery or big-box retailer. 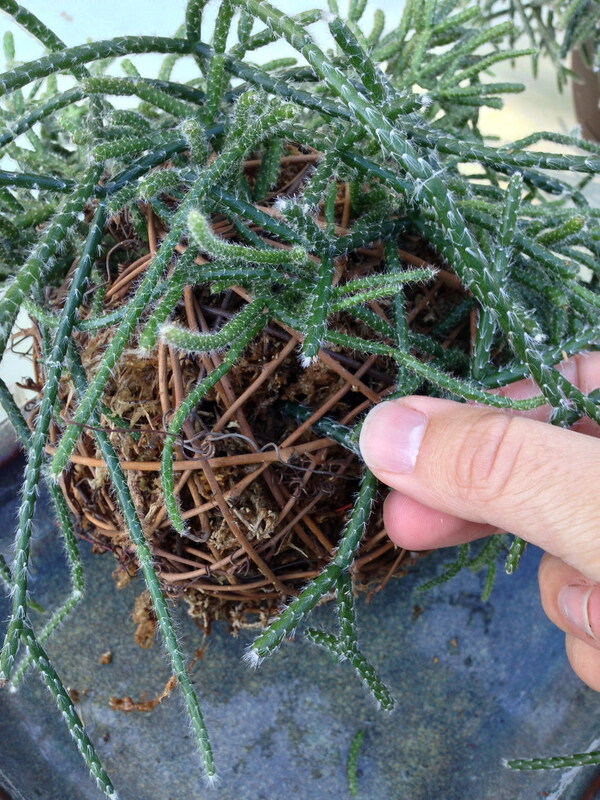 All you do is stuff a grapevine ball with moistened sphagnum moss, clip off stems of a Rhipsalis plant and carefully insert them into the moss. Since the stems are brittle, it does pay to take your time rather than just jamming them in. I’ve also added Tillandsias, commonly known as air plants to add a little bit of interest, but these aren’t necessary. To finish, just wrap a ribbon to the ball’s wire frame, hang from an overhang or ceiling and add a bow. Steve Asbell is author of Plant By Number: 50 Houseplant Combinations to Decorate Your Space, to be published in March 2014. His illustrations have appeared in Southern Living online and on Ferry-Morse seed packets, while his projects and writings have been featured in Mother Earth News and on Apartment Therapy. This entry was posted in Holiday Decorating, Holidays, House Plants, Uncategorized and tagged Christmas, decorating, holiday decorating, houseplants, mistletoe, mistletoe cactus, plants, Steve Ashbell. Bookmark the permalink.